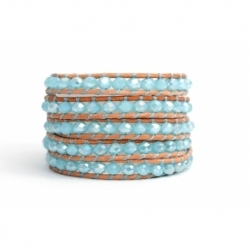 Colorful yet earthy, this BBHands wrap bracelet Crystal Style is a must have for your collection. The different colors in this design, providing an eye catching mixture of elements. 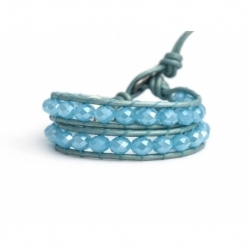 This crystal bracelet can easily compliment any look and makes the perfect day to nigth accessory. Crystal There are 46 products. This BBHands Crystal Style include eye catching faceted iridescent wedgewood crystals hand woven onto a white leather. This bracelet wrap around a woman's wrist 2 times and incudes two adjustable leather closure for a confortable fit. This BBHands Crystal Style include eye catching faceted iridescent boreale black cristals hand woven onto a black leather. This bracelet wrap around a woman's wrist 2 times and incudes two adjustable leather closure for a confortable fit. This BBHands Crystal Style include eye catching faceted iridescent sapphire boreal crystals hand woven onto a bronze leather. This bracelet wrap around a woman's wrist 5 times and incudes two adjustable leather closure for a confortable fit. 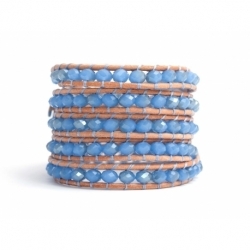 This BBHands Crystal Style include eye catching faceted iridescent blue pastel crystals with copper reflexes hand woven onto a natural light leather. 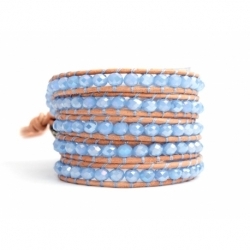 This bracelet wrap around a woman's wrist 5 times and incudes two adjustable leather closure for a confortable fit. This BBHands Crystal Style include eye catching faceted iridescent violet-blue crystals with grey shades hand woven onto a pearled white leather. 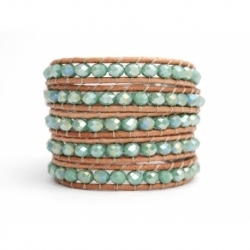 This bracelet wrap around a woman's wrist 5 times and incudes two adjustable leather closure for a confortable fit. This BBHands Crystal Style include eye catching faceted iridescent aztec borealis blue crystals hand woven onto a dark green leather. This bracelet wrap around a woman's wrist 5 times and incudes two adjustable leather closure for a confortable fit. 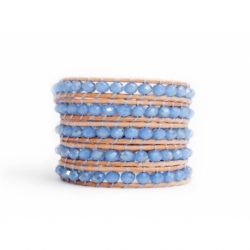 This BBHands Crystal Style include eye catching faceted iridescent violet-blue crystals hand woven onto a natural light leather. This bracelet wrap around a woman's wrist 5 times and incudes two adjustable leather closure for a confortable fit. 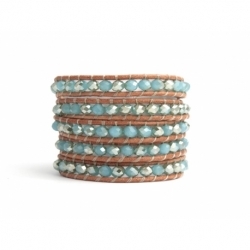 This BBHands Crystal Style include eye catching faceted iridescent violet-blue crystals hand woven onto a pearl leather. This bracelet wrap around a woman's wrist 5 times and incudes two adjustable leather closure for a confortable fit. This BBHands Crystal Style include eye catching faceted iridescent smoky brown boreal crystals hand woven onto a dark brown leather. This bracelet wrap around a woman's wrist 2 times and incudes two adjustable leather closure for a confortable fit. This BBHands Crystal Style include eye catching faceted iridescent dark gold crystals hand woven onto a metallic brown leather. This bracelet wrap around a woman's wrist 2 times and incudes two adjustable leather closure for a confortable fit. 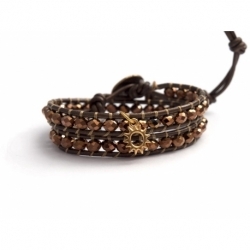 This BBHands Crystal Style include eye catching faceted iridescent dark gold crystals hand woven onto a bronze leather. This bracelet wrap around a woman's wrist 2 times and incudes two adjustable leather closure for a confortable fit. This BBHands Crystal Style include eye catching faceted iridescent boreale gold crystals hand woven onto a metallic brown leather. This bracelet wrap around a woman's wrist 2 times and incudes two adjustable leather closure for a confortable fit.